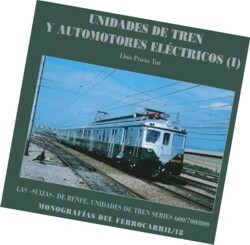 With this volume of the collection “Monografías del Ferrocarril ” it is given beginning to a series on the Units of train and electrical autorails, which in this first book deals with the "Swiss" units of Renfe's train. The “Units of train ” (briefly U.T.) of Renfe's Swiss origin they were one of the fundamental props in the electrifications to 3.000 volts of the sixties and seventies. These trains were included in the series 600, 700 and 800, later registered according to the International Union of Railroads (UIC) as series 436, 437, 438 and 435. They were destined in Asturias and Cantabria, though most of his workforce was in Catalonia and were protagonists of the displacements for a generation of workers, familiar trips or of trippers in metropolitan areas and also of wide rural zones. In some occasions the trip could offer a magnificent inducement: To enjoy the sight in a viewing-point favoured in the cars without reforming of the series WM and in the tows WRc. In these cars the travelers could occupy the seats and the space placed next to the cabin of the machinist. When advance the electrifications of Renfe's network in direction Valencia, Lleida and Saragossa, the U.T. Swisses were dispersing to other destinations of initials. With the arrival from middle of the seventies of the new units of train of the series 440 the redistribution of the Swisses hastened furthermore, coming to Andalusia, Valencia, The Spot and Madrid. The renovations effected in the series were significant, so much for the restructuring in the format of the trains like for the substitution of his exterior and interior aspect: From the decoration plata/verde to the yellow / blue one of the 80s, up to coming to the integral reform in the nineties (The "New" series 435). In rest of the history already we know her: The impressive conversion of the service of Renfe's surroundings with the units of the series 446/7 and 450/1 and the reform of the series 440 did not leave place the Swisses, and the last trains of the series stopped circulating at the end of the year 1994. A page was closed this way of more than 35 years of a history that, with the technology of the moment, transported million persons both in the areas of surroundings and in the regional rail links.